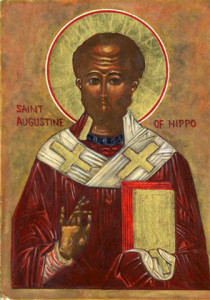 Augustine – following St. John – makes it simple: love is love. Love God, love your neighbor: they are inseparable. Augustine speaks of this in terms of the Church: if we love God, we love Jesus, God incarnate; and if we love Jesus, we love all the members of his body, the Church. I only add, as I have mentioned here before, that for Augustine, love of the Church also includes all those who might one day be members of the Church – all those for whom Christ died, which is everyone. But if you love your brother, could it be that you love your brother and love not Christ? How could that be, when you love members of Christ? When therefore you love members of Christ, you love Christ; when you love Christ, you love the Son of God; when you love the Son of God, you love also the Father. The love therefore cannot be separated into parts. Choose what you will love; the rest follow you. Suppose you say, I love God alone, God the Father. You are lying: if you love, you love Him not alone; but if you love the Father, you love also the Son. Behold, do you say, I love the Father, and I love the Son: but this only, the Father God and the Son God, our Lord Jesus Christ – who ascended into heaven, and sits at the right hand of the Father, that Word by which all things were made, and the Word was made flesh, and dwelt in us: this alone I love. You are lying; for if you love the Head, you love also the members; but if you love not the members, neither do you love the Head. Do you not quake at the voice uttered by the Head from Heaven on behalf of His members, “Saul, Saul, why do you persecute ME?” (Acts 9:4) The persecutor of His members He called His persecutor: His lover, the lover of His members. Now, what are His members, you know, brethren: none other than the Church of God. In this we know that we love the sons of God, in that we love God. And how? Are not the sons of God one thing, God Himself another? But he that loves God, loves His precepts. And what are the precepts of God? “A new commandment give I unto you, that you love one another” (John 13:34). Let none excuse himself by another love, for another love; so and so only is it with this love: as the love itself is compacted in one, so too all that hang by it does it make one, and as fire melts them down into one. It is gold: the lump is molten and becomes some one thing. But unless the fervor of charity be applied, of many there can be no melting down into one.